Antonio Carmona Baraza has dedicated his life to the burners. When he finished highschool he already knew what he wanted to dedicate his life to: cooking. He comes from one of the most traditional families in the gastronomy world in Almeria, the Carmona family, who have been the owners of the Terraza Carmona restaurant in Vera for more than 70 years. From a very young age he discovered the traditional Almeria cuisine from his mother and grandmother’s hands, for example: torticas de avío, gurullos, guiso de pelotas….. They instilled in him the passion for everyday cookery and the flavors of the land. His father taught him the art of being a fine restaurateur, meaning that a satisfied customer is always the best reward. Today Chef Antonio Carmona blends his family knowledge with those he learnt in his profession in the Escuela de Hostelería and in the University of Granada, making each dish unique. 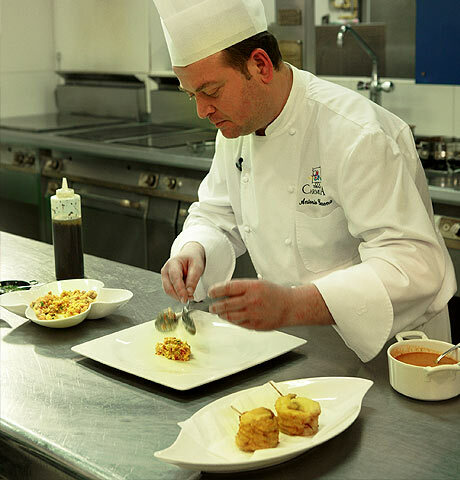 As Head Chef at the Terraza Carmona (since 1991) he offers us an inspirational traditional cuisine dressed in creativity and wit. Not everything stays within the walls of his kitchen however. His prestige precedes him as he has taken his cuisine all round the world: to Universities for presentations, gastronomic days, from Madrid to Tokyo, passing through San Sebastián, Málaga, Brussels, Berlin, Amsterdam or Guadalajara (México). Furthermore, great chefs have also stepped into his kitchen, given that he has been the organizer of the “The Fierce Bull in the Kitchen” Gastronomic Days for 22 years. He has managed to attract different and renowned restaurants to visit him from national and international locations. 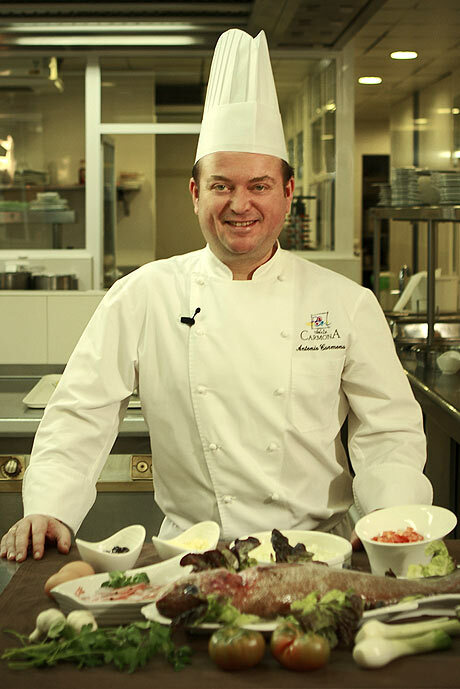 Currently, the 47-year-old Chef Antonio Carmona, is a cook with vast experience and professional prestige. The passion towards his profession and his innate interest towards gastronomy is constantly pushing him to research more and impulse his knowledge and abilities. This establishment was awarded the “Premio Alimentos de España a la Mejor Restauración” by the Ministerio de Ambiente y Medio Rural y Marino, in its XXIII edition, in 2010. He is a habitual and trusted collaborator in many congresses, conferences, cookery books and Cookery Days, his recipe books are well acclaimed and much requested by his loyal followers. 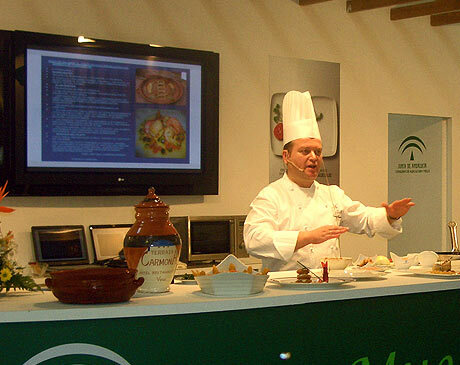 The flavors of his everyday evolved cookery prepared with great talent and quality seasonal produce, as well as the new versions of the typical stews and casseroles such as the “copa templada de gurullos con conejo” and the “mille feuilles de ajo Colorado con ray and Garrucha shrimps”, is a popular favorite of those who are lucky enough to relish these delicacies.